I came across this really awesome recipe on the very cool local Nom-Nom blog, run by Conrad & his wife. They cover all sorts of cool foodie type things, check them out. 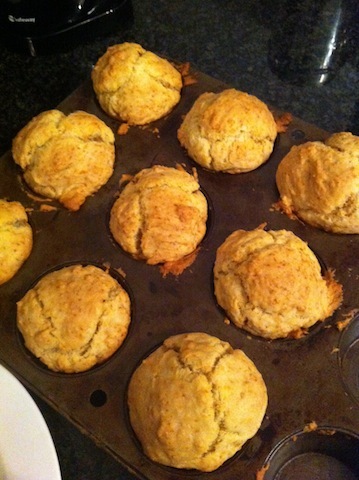 If you follow me on Twitter, you may have seen this, but I thought I would re-post the worlds easiest scone recipe here. These are DIVINE, and with some jam & butter they rock. And, they cheap to make. Bang them all together in a mixing bowl, and mix together, till all the ingredients mixed properly. Fill the mixture into a muffin tin (about ½ to¾ full) & bake for 20-25 mins at 180 degrees, and BOOM, you get this. No lies. And they taste absolutely awesome. Try it, and let me know.